Greg Ayres has been blasting his way through 2017! He was thrilled to make his second appearance in Dragon Ball Super earlier this year as Frost, and equally excited to help blast bugs as Geo in Sony Picture's Starship Troopers : Traitor of Mars. 2017 also gave him the opportunity to reprise one of his favorite roles as Son Goku in Saiyuki Reload Blast, and will also be appearing in Haikyu as Yu Nishinoya, as well as voicing Zenji Marui in Food Wars. With over 290 credits to his name, he has managed to play a variety of characters that are almost as colorful as his hair. Some recent roles include Nagisa Haruki in Free, and Free Eternal Summer, MonoKuma in Danganronpa, Clear in Dramatical Murder, and Doug in Gangsta. Thrilled to be a part of the Toonami re-launch in the roles of Ganta Igarashi in Deadman Wonderland, and Heihachi Hayashida in Samurai 7, and even more thrilled to follow that up the in the following summer's thriller Another as Kouichi Sakakibara. He can also be hear as Satoru Asahina in From the New World, Kenji Nakanishi in Say I Love You, Sion in No. 6, Heisuke Toudou in Hakuoki, Tommyrod in Toriko, Tomoki Sakurai, in Heaven's Lost Property, and Volken in The Book of Bantorra. Some of his all-time favorite roles include Son Goku in Saiyuki, Chrono in Chrono Crusade, Kaoru Hitachiin in Ouran High School Host Club, Youhei Sunohara in Clannad, Yuki in The Wallflower, Leo in Ghost Stories, Satoshi Hiwatari in DNAngel, Kaworu Nagisa in the Director's Cut of Neon Genesis Evangelion, and Negi Springfield in Negima. When he's not in a booth with headphones on, you can usually find him sporting headphones behind "the decks" at many a music event. 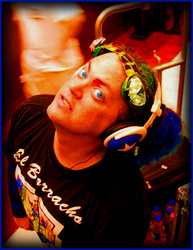 A veteran nightclub DJ of many years, he has jumped at the opportunity to play music and organize late night dances at many of the conventions he attends. He currently helps organize dance and music tracks at several US conventions. Greg is also a member of Project BECK, who perform music from the anime Beck Mongolian Chop Squad, and has had a blast reliving the music from the show with his friends. Thrilled to be able to share his love of music with anyone willing to listen - from packed rooms at anime conventions, to the legendary stage of The Knitting Factory (NYC), he's always ready to make a little noise.